Anupam pal borne isn 11th oct 1991 in jamshedpur.6th year diploma in fine arts in fine arts form tagor school of arts (tagor academy ) jamshedpur,and apprying in 3d animation and vfx (baavfx) from MAAC (MAYA ACADEMY OF ADVANCED CINEMATICS) chowringhee, kolkata. mr. anupam pal ,an inredible personality with exceptional talents and sheer passion,redefined the culture of artisan ship he is jamshedpur based artist,who dedicated his self to create indiaaan style painting.since the time anupam took domain he create numberless exquisitepainting,which have been praised by no of corporate house in jamshedpur. the reflection of his visionary shades & the storkes of brush can palpably be seen in his DIAM ART painting and spiritual art Paintings .Dynamism of his through reflects in hes abstract rad-ha Krishna painting. 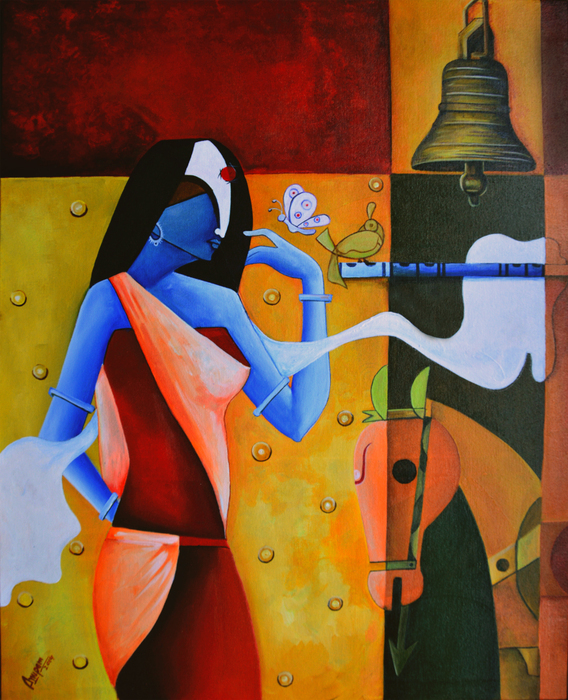 anupam painting have ever been the center of attraction for art lovers,who love to behold something innovative & fresh. 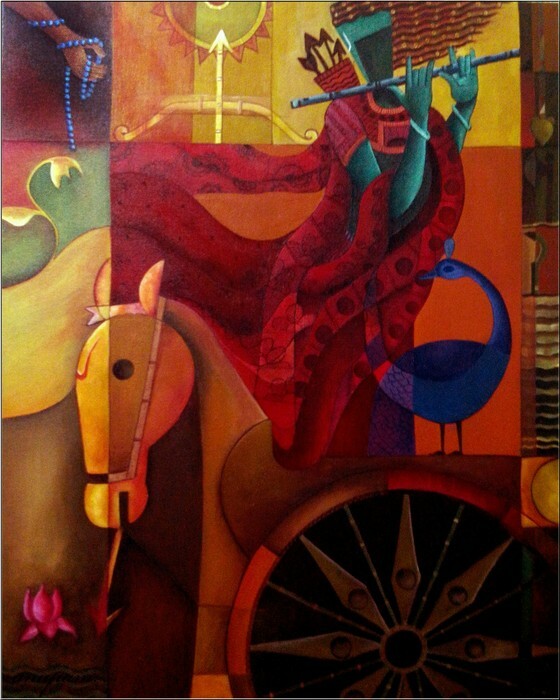 anupam has showcased countless marvelous paintings in its well furnished studio. in addition a begging a prominent artist, Anupam is also know as an 3d animation and interior decorator,who always remains in limelight due to her extraordinary capability to turn the dull-ambiance of an establishment into a highly plush one.he gives a feely touch of artistry when refurbishing ones ,interiors. anupam is a painter par excellence, who started painting in he chilled hood sketch shaktiman (popular tv seriel) in wall by charcoals frist art teacher is his grand eather let. BHOBESH CHANDRA GHOSH. Anupam blends various kind of oil,water colour and mix media to create the epitomes of excellence. he mainly emphasizes one the soft side of life. joy and love from a considerable part of her magnificent paintings .he carries great resoluteness and sprit to set new benchmarks in the field of art . 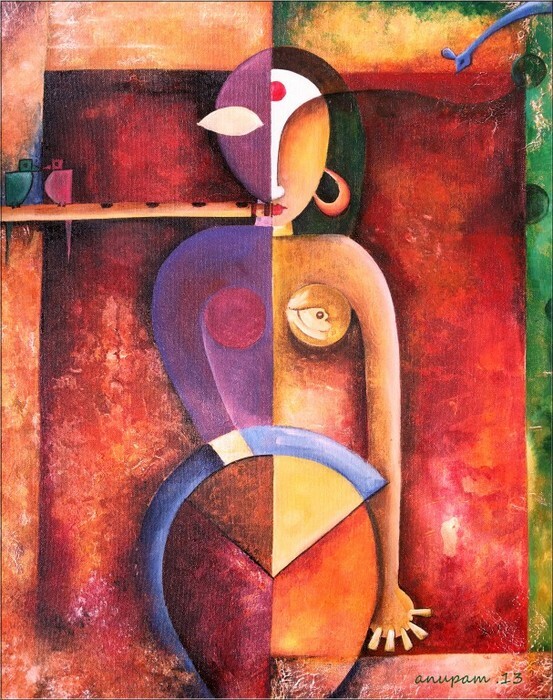 In he quest to explorethe innerself ,Anupam has created endless paintings viz. when it comes to painting on canvas, Anupam holds unparaalleled expertise and vary good flow. Anupam art today symbolizes the trust, creativity and tradition with which it has-been able to establish an icon image for itself among est highly sought after abstract paintings exporters. ALL ANUAL EXHIBITION OF TAGOR SCHOOL OF ARTS JAMSHEDPUR (2007-2013). ALL INDIA ART EXHIBITION FROM DIPAKA ARTS AND TRUST JAMSHEDPUR (2008). SOLO-NANDLAL BOSE ART GALLERY ,JAMSHEDPUR (2011). GRUP EXHIBITION OF ACEDEMI OF FINE ART ,KOLKATA (2009). 6th ANUAL ART WORK SHOP BY THE TAGOR ACEDEMY JAMSHEDPUR(2012). SHILPANGAN KALA NIKETAN (ASANSOL (2013). WINGS OF COLOUR GRUP EXHIBITION OF JAMSHEDPUR ARTIST AT NANDLAL BOAE ART GALLERY ,JAMSHEDPUR.(2013). 1> JUNIOR ARTIST OF THE YEAR AWORD FROM DIPEK ART AND TRUST JAMSHEDPUR (2008). 2>3rd AWARD IN RENINSON ARTIST AND WRITER ASSICOCION (RAWA) KOLKATA (2010). 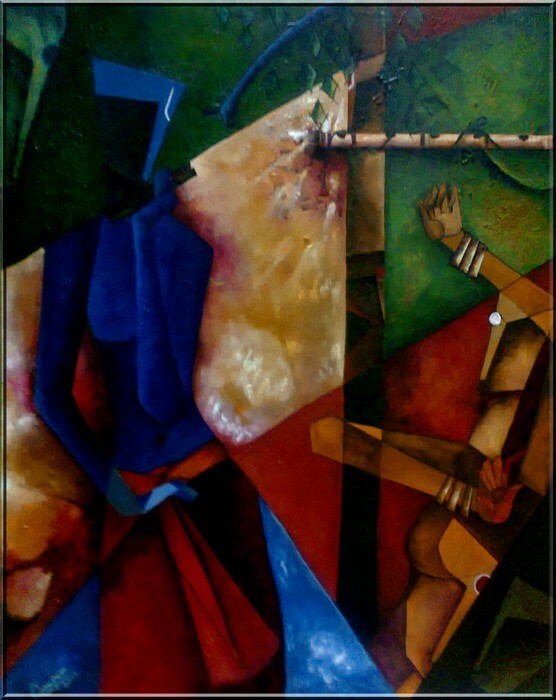 3> 2nd AWARD IN RENINSON ARTIST AND WRITER ASSICOCION (RAWA) KOLKATA (2011). 4> 3RD aword IN 2nd OPEN JHARKHAND SIT AND DROW ART COMPITION JAMSHEDPUR (2010). IS THE WORST THIN THAT CAN HAPPEN TO ANY ARTIST. THE DAY THE ARTIST WILL SAY I AM SATISFIED, HE WILL KILL THIS CREATIVITY AND THAT WILL BE THE DEATH OF AN ARTIST. Description The artist has shown two sides of a woman, on one side the woman is suffering from pain and on the other side he has shown the power in a woman. He has shown that a woman can create and destroy. Category Painting Style Contemporary Subject Abstract Medium Acrylic on canvas Release Year 2013 Size 61 x 76 cm/24 x 30 inches Weight 3 kgs. 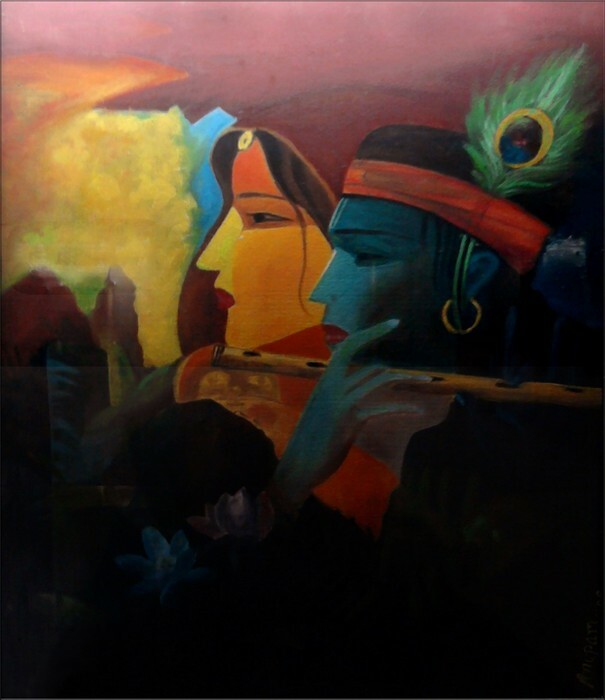 Price 10,000 INR/179 USD Shipping Condition Rolled Authenticity Certificate Yes Description In this painting the artist has show the eternal love of two souls. Description	In this paintings the artist has potrayed the saarthi of Arjun's rath.